Iris Calderhead was born in Marysville, Kansas in 1889. She was the daughter of William Alexander Calderhead, a U.S. Representative to Congress from Kansas who served from March 4, 1895-March 3, 1897. Iris graduated from the University of Kansas and taught literature in Kansas at Wichita High School. She eventually gave up teaching literature to become an organizer for the National Woman’s Party. 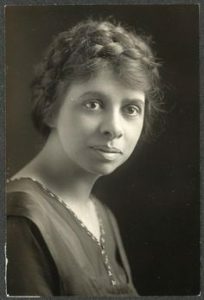 In addition to serving as an organizer for the National Woman’s Party, Iris participated in protests with other party members in Washington, D.C. It was on Independence Day in 1917, that the 28-year-old Iris marched toward the White House with four other suffragists, Helena Hill Weed, Vida Milholland, Gladys Greiner, and Margaret Whittemore. The group carried a banner that read, “Governments Derive their Just Power from the Consent of the Governed.” As the five approached the sidewalk in front of the White House, twenty-nine policemen arrested them. Two days later Iris was charged with obstructing the sidewalk and was given the choice of a $25 fine or three days in jail. She refused to pay, and served her prison sentence in the District Jail in Washington, D.C. Later in life, Iris married John Brisben Walker, a prominent magazine publisher who owned Cosmopolitan magazine from 1889 to 1905. Source: Inez Haynes Irwin, The Story of Alice Paul and the National Women’s [Sic] Party (Fairfax, Va: Denlinger’s Publishers, 1977), 126-127 and 229.